We've added a new widget to support RSS feeds. An RSS feed is a feed that can be configured to pull information from other systems. For example you can use the RSS feed widget to display posts from your seperate blog site. 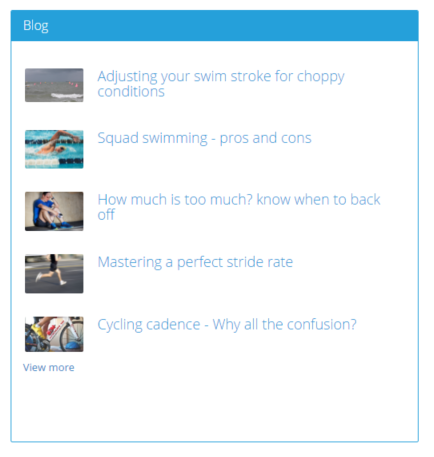 Great if you've had a blog running for a long time outside of your Training Tilt site or on a seperate website. You should be able to find the feed URL somewhere in the settings of the external platform, if not just ask the support team of the platform for help. Once you've got the feed URL go to the platform settings page of your Training Tilt site and select the "Widget Settings" tab. Paste the URL into the feed url setting and also give the widget a title. Now turn on the RSS Feed widget where ever you want it to display. Not all feeds with include the images, in which case we fall back to using your logo.